They come in coffee cups, small cans, large cans, shots, you name it -- energy drinks are everywhere. If the marketing is to be believed, these magic elixirs help us accomplish amazing feats in five hours (5-Hour Energy), excel in extreme sports (Red Bull and Monster), and are the best part of waking up (Folgers). America is addicted to energy, and every company in the drink business is trying to get a piece of the action. There's no shortage of choices for those looking to imbibe. But only a few of these manufacturers will succeed, so investors must choose their beverage carefully. It all started with our growing addiction to coffee. Americans drink a total of 400 million cups of coffee per day, more than one cup per person. Recently, the trend has been toward more straightforward energy drinks or shots. Consider this comparison: Monster Beverage (MNST) -- which, like Red Bull, is one of the leaders in the energy drink market -- has seen its revenue grow 20 times (2,000 percent) in the last 10 years. Starbucks (SBUX) has grown two-and-three-quarters times (274 percent) during the same period. 5-Hour Energy leads the energy-shot front, selling 1.5 billion energy shots since it was launched in 2004. The company behind the product, Living Essentials, had sales of $1 billion last year and pocketed $600 million in profit. So, What's Brewing at Coke and Pepsi? With Red Bull and Monster dominating the energy drink category, soft drink giants Coca-Cola (KO) and PepsiCo (PEP) can't seem to get a foothold in the market. Coca-Cola has tried to sell Full Throttle, NOS, Surge, and Vault, with little success. Pepsi has tried to expand the Mountain Dew brand with Amp and now Kickstart, which is being heavily promoted during March Madness. Time will tell if Pepsi's latest attempt to sell high-voltage Mountain Dew is more successful than the first, but I doubt it will be. Just the fact that Coca-Cola and Pepsi are putting so much effort into energy drinks shows how important the market is. Still, they seem to have no discernible advantage over the smaller brands. Both Red Bull and Monster market their product differently than Coke or Pepsi ever did. They've gone after extreme sports, attaching their brands to the craziest athletes on earth. Red Bull has now gotten into film production and owns a fleet of helicopters and other aircraft that have become a marketing dream. As long as these companies are playing an outsider strategy but attaching to extreme athletes, they'll be able to hold off the big dogs. After all, everybody likes an underdog, a role extreme sports has played for a long time. Right now, Red Bull, Monster, and 5-Hour Energy command the largest and most lucrative market share in the energy drink space, and that's not likely to change. 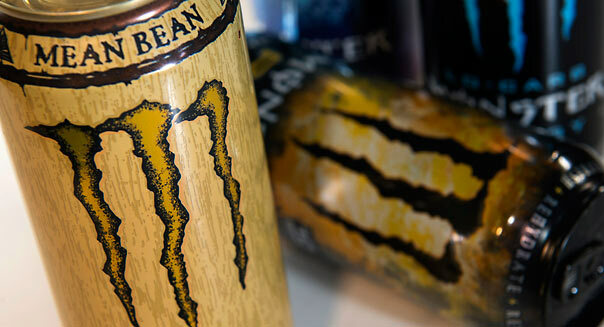 Since both Red Bull and 5-Hour Energy's parent, Living Essentials, are privately held, investors are left with Monster Beverage for exposure to energy drinks. Monster plays second fiddle to Red Bull, but it has done a good job expanding its product category beyond its original flavor. There are now more than two dozen varieties, including a line of coffee-flavored drinks. The company is outgrowing Coke and Pepsi by a wide margin, but won't grow as quickly as it has in the past. Analysts are expecting 13 percent revenue growth this year and 22 percent growth in profits -- great numbers for a company trading at 18 times forward earnings estimates. The stakes are high for Monster Beverage these days. The stock had been nothing short of a rocket, but recent developments have sent shares spiraling downward. Health scares sparked a number of investigations at the state and federal level into the energy drink's role in several fatalities. Motley Fool contributor Travis Hoium has no position in any stocks mentioned. The Motley Fool recommends Coca-Cola, Monster Beverage, PepsiCo, and Starbucks. The Motley Fool owns shares of Monster Beverage, PepsiCo, and Starbucks.